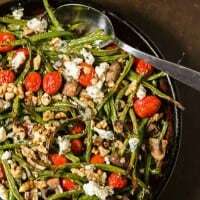 Crisp, tender haricots verts cozy up with burst tiny tomatoes, creamy bleu cheese, and toasted walnuts… Roasted Green Beans with Tiny Tomatoes and Bleu Cheese is a simple vegetable side dish that is quick and easy enough for a weeknight, yet elegant enough for your dinner party or holiday table! What glory can there be in snapping green beans? A few weeks ago, I was given a large bag along with the inherent task of discovering just that. The beans were dirty, and more numerous than I hoped. They also had some spots that would need pruning before the whole bunch could be washed and prepared on the stove. Thinking about a plate fully laden with freshly cooked and delicately seasoned green beans, brimming with potassium and shell outs, impelled me to begin the task, made longer by the hems and haws of getting started. Do you have childhood memories of green beans? I most definitely do! My grandma Cecil Webb was the quintessential grandma – apron around her waist, soft white hair pulled back, a big lap, and a huge heart… and, she made the best green beans! Her green beans might start out “dirty” with “spots that would need pruning,” but they ended up in a cast iron pot on the back burner of her stove simmering with hunks of meaty bacon or ham. It is interesting the way food can trigger memories of half a century ago. Modern convenience has in some ways deprived us of some of life’s simple pleasures. I guess it all depends on your perspective. I most often purchase my green beans at my local Sam’s Club in a rather sterile looking package of pre-washed “haricots verts” or thin, young green beans. After a good washing, they’re ready to go – no need to prune, pick, or snap them. Green beans are available year round in most markets, but in Las Cruces, they’re best in the cooler months. The convenience and availability of fresh produce in our local markets should make it difficult to justify serving canned and frozen vegetables. Roasting vegetables intensifies their flavors, and is by far my preferred cooking method during the cooler months. Green beans benefit from a quick steaming prior to being roasted. 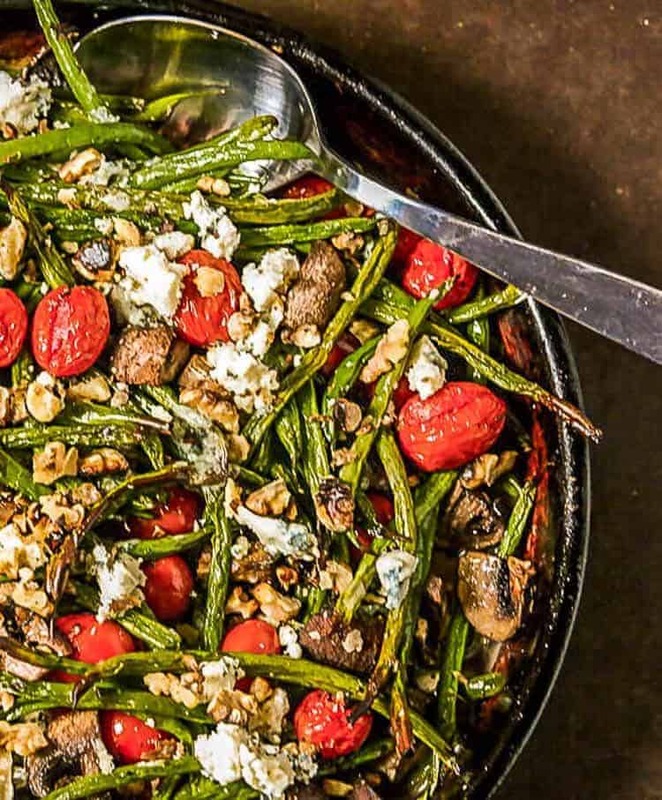 Roasted Green Beans with Tiny Tomatoes and Bleu Cheese combines just a few simple ingredients and comes together very quickly. It is indeed quick and easy enough for a weeknight, yet elegant enough for a dinner party side dish. Just look at the beautiful colors and textures in this photo! Does it make your mouth water? I own quite a collection of appliances. One that I really didn’t expect to use often, has earned its place in the accessible portion of my pantry closet. 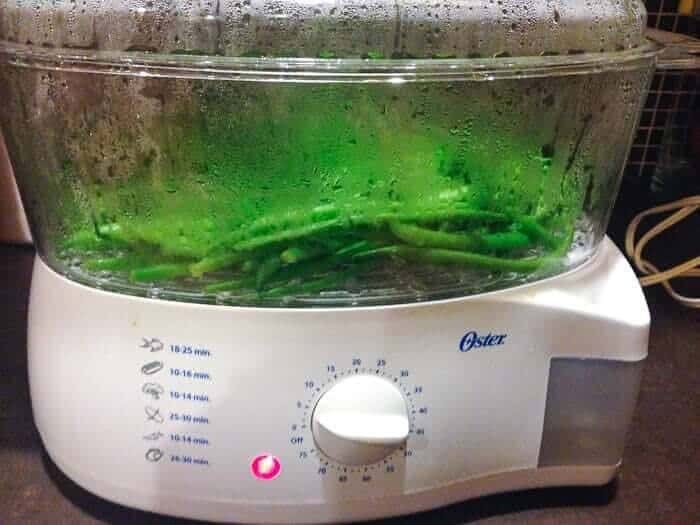 🙂 This steamer does a beautiful job steaming the green beans to perfection in 10 minutes and with no oversight from the cook! Of course you can steam them on the stove, just be careful to not overcook them. While the green beans steam, prep the other ingredients – starting with pre-heating your oven. 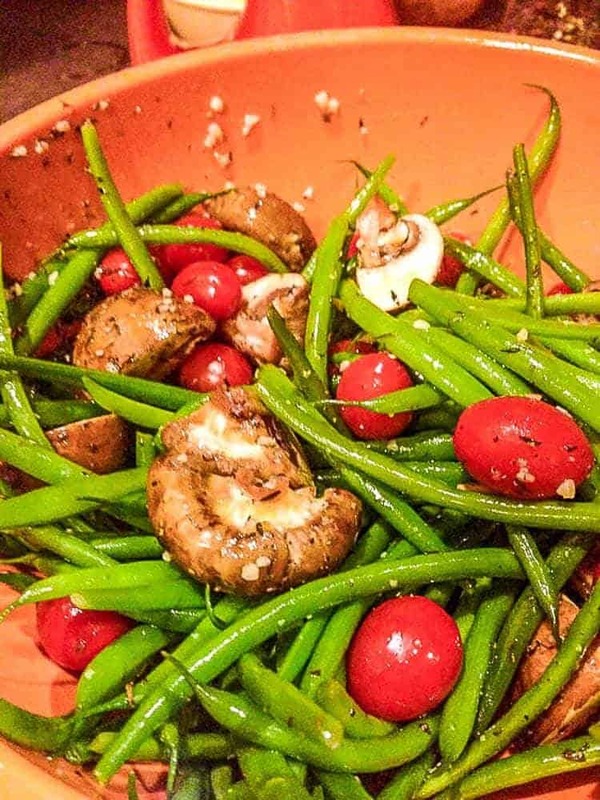 The tomatoes, cremini mushrooms, and green beans are tossed with a bit of olive oil, garlic, and thyme leaves. The mixture roasts in the oven for 15-20 minutes, bleu cheese is crumbled over top, and is returned to the oven for 5 minutes. You can have this on your table in 30 minutes. 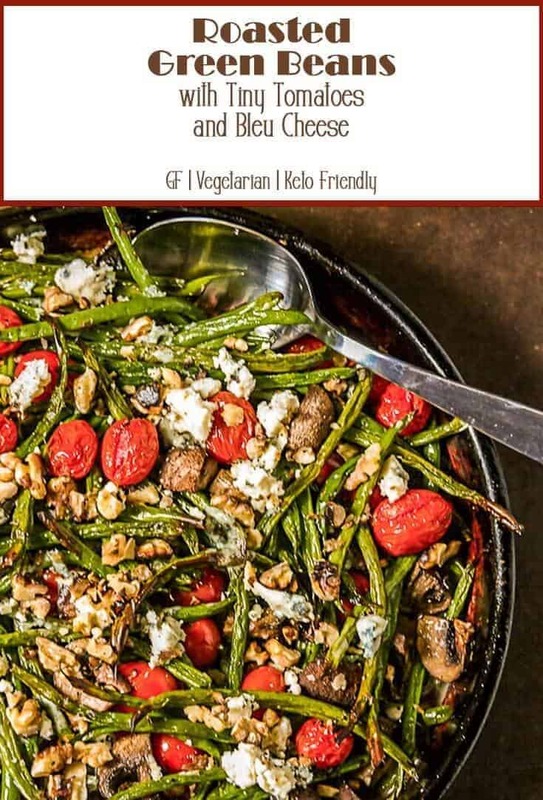 My husband – sidekick, best friend, photographer’s helper, and ever-so-patient for dinner guy – wanted me to make sure my readers know these green beans are fabulous cold the next day. I typically serve them at room temperature. Last night, I did angel hair pasta tossed with shallot, capers, garlic, lemon, and a bit of chicken stock then topped with a sautéed fish filet. The flavors complemented each other beautifully! The meal paired well with a New Zealand sauvignon blanc. A simple vegetable side dish that is quick and easy enough for a weeknight, yet elegant enough for your dinner party table! Steam the green bean just until tender-crisp. Do NOT overcook! I do 10 minutes in my steamer. While the green beans steam, prep the mushrooms. You want large pieces, not slices. Add the mushrooms to a large mixing bowl. When the green beans are tender-crisp, add them to the bowl with the mushrooms. Add the tomatoes whole. Drizzle the vegetables with olive oil; add salt, pepper, garlic, and thyme leaves. Toss well to combine. Spread out the mixture on a 13 x 9 baking dish. Roast 20 minutes or so (15 convection) until tips of green beans begin to brown and tomatoes have collapsed. Remove from the oven, and add about half the crumbled bleu cheese over top. Return to the oven for about 5 minutes. Remove from the oven. Add the remaining crumbled bleu cheese just prior to serving. Garnish with toasted and chopped walnuts if using. Enjoy! 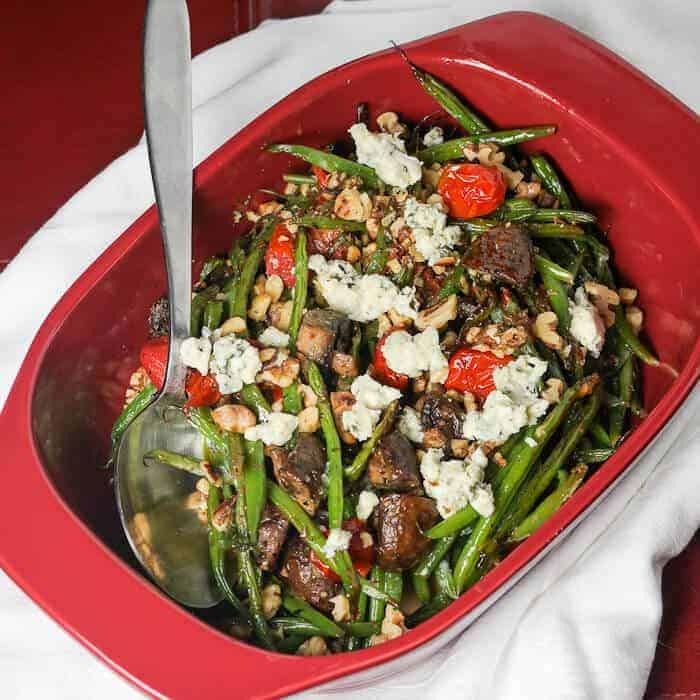 * This dish works best with young, thin green beans like haricots verts. If you substitute snap beans, you will need to adjust the cooking times. ** If you substitute button mushrooms, or your mushrooms are small, you will want to use them whole. Serve hot, room temperature, or even cold. I know many of my readers consider bleu or blue cheese to be "stinky feet cheese" - as my 2 of my 4 sons refer to it. If you must substitute, try chevre or feta. Macronutrients (approximation from MyFitnessPal.com): 151 calories; 7 g protein; 12 g carbohydrates; 9 g fat. Numbers include a total of 1 tablespoon of chopped toasted walnuts.